When life hands you lemons, the right guy needs to be there to make the lemonade. Life isn’t just handing Mackenzie lemons—more like chucking them at her. With the recent tragic death of her baby sister, her best friends both getting married and her feeling even more alone than ever, Mackenzie has had about all she can take. Why can’t she find the right guy? Her besties, Molly and Tiffany, are determined to help her, but little do they know he may already have arrived. The man who had dashed all of Mackenzie’s dreams of the perfect happily ever after is back and this time for good. Gideon’s return flips her world upside down in more ways than she can count. Why does life have to be so darn complicated? Afternoon lattes and Friendship Fridays with her girlfriends are all that seem to help Mackenzie survive her insane rollercoaster of single life. Once worried that she’d wind up an old maid or a crazy cat lady, Mackenzie reluctantly finds herself back on the dating scene. She juggles some new romances and one not-so-new one, discovering that there’s A Latte of Love out there. I did not read the previous books, but you can tell how much these women mean. This is Mackenzie's story and she was an awesome character. Mackenzie is struggling with finding someone she feels connected to. She is also trying very hard to feel happy for her friends, who have found their person. While she is trying to "get back out there," as her friends call it, none other than Gideon shows up. After breaking her heart a few days before their wedding, Mackenzie is hurt, angry, and sad. Even years later, she can't help but feel something for Gideon, despite what he's done. Mackenzie's friends... well, I loved them. They were fierce, loyal, and most of all, they were forgiving. I loved how they made Gideon work for it. They were not going to just allow him to come back and re-injure their friend again. I think where this story falls a little short is with her dating scenes. I know that she did try to get out there, but it felt very strange – almost like high school dating scenes. Maybe that was because deep down she knew they weren't right, but I also felt there was just something not quite right. Overall, this was a sweet story about second chances, redemption, and love. I really enjoyed it and felt that Herrmann did an amazing job at weaving through what could have been a very angst filled story without going overboard. Gloria Herrmann is a contemporary romance author living in beautiful eastern Washington. All of her books have been set in Washington and she is proud to show readers how gorgeous her state is. An avid reader and lover of words, becoming an author has been a dream come true for her. She still pinches herself all the time and wonders how she got so lucky. Gloria remembers her mom giving her a paperback romance novel when she was a teenager. It was a pretty exciting book, filled with suspense, love, and an overall excellent storyline. That was it. She was hooked. Gloria began to devour these romance stories that varied over the years from sweet to sultry, consuming thousands of books and stories. Each time she finished reading a novel, the desire to write her own grew stronger. As ideas for books were born, her go to genre was contemporary romance. Why romance? She simply loves it. That’s why she writes it. What is there not to love about falling in love and finding that special person to share your life with? Who doesn’t wish for a little passion, butterflies fluttering in your stomach, and that happily ever after? In Gloria’s eyes, that’s what it’s all about. 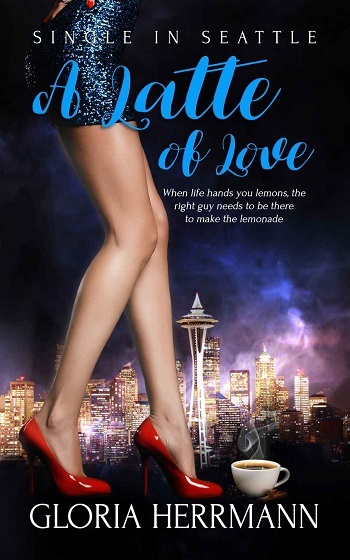 Reviewers on the Wicked Reads Review Team were provided a free copy of A Latte of Love (Single in Seattle #3) by Gloria Herrmann to read and review.